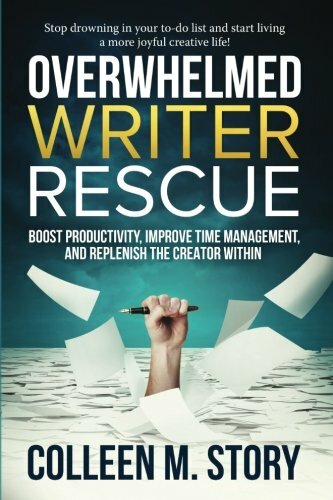 “Overwhelmed Writer Rescue” by Colleen M. Story, provides sound guidance for boosting productivity and improving the quality of your writing time through clear, practical advice and applications. With simple, but not easy steps, Story outlines ways to restore and reset your creative mindset in a manner that is easy to read and comprehend. Presented in four sections, each one provides sensible, graspable information to help you achieve the writing life you desire. Will Someone Please Give Me More Time to Write? In this aptly titled introduction, Story establishes the crux of the problem: the absolute need for more writing time. The author’s passion and excitement to share what she’s learned with others is inspiring and sets the tone for the rest of the book, instilling confidence in the reader from the very beginning. Throughout the book Story inserts what she calls Time Treasures – exercises and tips designed to help you find more time in your life for writing, and getting the most value out of that time. I found these tips most informative and useful. The first section clearly defines obstacles such as romanticizing what being a writer looks like versus the busy, demanding reality of the majority of writers today. Learning how to accept that we are human and can only do so much every twenty-four hours, Story suggests ways to let go of unrealistic expectations and things that don’t serve our creativity. Part II: Increase Productivity to Expand Your Writing Time provides valuable information on how to prioritize and focus, understanding when your best time of the day is to write, ways to get started writing when you feel like you’re in a slump, and the importance of taking breaks. Of particular interest personally, as I’ve struggled with this my entire life, is the section on learning how to say “no” to others, freeing up time for the things that are important to me. Good stuff. The entire book is well-written, enlightening and inspirational, but if I had to pick a section that resonates most with me, it would have to be Part III: Outwit Your Brain’s Productivity Saboteurs, which outlines the seven specific personality traits that sabotage your most well-intentioned efforts. The way Story describes my individual productivity thieves such as perfectionism, workaholism, and setting destructive goals – it’s almost like she knows me! Seriously though, these chapters will help you understand your biggest stumbling blocks and set you on a more productive course. The final section wraps things up nicely, presenting four skills writers must learn for a long, productive career in writing. Overall, I highly recommend “Overwhelmed Writer Rescue” by Colleen M. Story. I discovered more than a handful of items about myself and my practices that hinder my ability to be my best creative self. I recommend taking your time going through each chapter and section of the book. If there is a survey – take it, if there is an activity or writing prompt/assignment – do it! They are well worth the time! Though geared toward writers, I believe this book would be a successful tool for anyone wanting to learn how to overcome procrastination and your natural productivity obstacles to increase motivation and free up more time for doing the things you love.